I love jicama. I love chips and other munchy snacks. 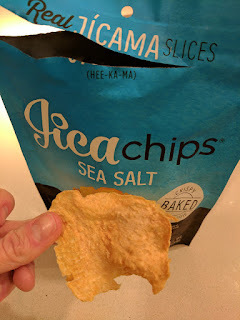 I was thrilled, thrilled, to discover jica chips, aka, jicama chips. Take a veggie I love and turn it into chips? Fairly healthy ones at that? Yes! If you aren't familiar with jicama, which, I wasn't until a few years ago, it is also sometimes called a "Mexican potato", or, if you are in Australia, a "yam bean". It is a kinda ugly tuber, that is far juicier than you'd expect. Looks like a potato, but bites like a pear? Except it isn't sweet. A savory apple-potato? I know I'm not doing a good job describing jicama, but, I really don't know what else to compare it to. Maybe like a water chestnut? It is juicy, not sweet, and really crunchy. I love it, fresh, just to munch on. I don't even require dips with it, although, of course I prefer dips. So, Jica Chips. A healthier alternative to potato chips, since jicama has about 50% the carbs of a potato. And then they bake them, rather than fry. 100 calories gets you 10 potato chips, or, 25 jicachips. 25 > 10. They are also high fiber, non-GMO, gluten-free, vegan, paleo, etc, etc. Jica Chips are available in 6 flavors - some savory (smoked bbq, sea salt, white cheddar), some spicy (spicy soy ginger, chili lime), and one sweet (cinnamon sugar). I was only able to try the basic sea salt flavor, but I'd gladly try others. My first impression was not a good one. I opened the bag, and instantly was met with a strange odor. Like, really bad. Just opening the bag made the air around me undesirable. Ojan reached out for the bag, took one whiff, and turned away. We both agreed the smell really did ruin these. But I pushed on, given how excited I was by the idea of the jicama chips. They didn’t taste like they smelt at all. They were delightfully crunchy, and I loved the large size slices, most pieces much bigger than standard potato chips. They were perhaps a bit too salty, but, I like high salt level. That said … I didn't really taste jicama. The result was something that didn't seem very special, just another root veggie chip. They grew on me, particularly once I got over the smell, but I still wanted them to be something more. Still, a good healthier alternative for my snacking habits, and I'd love to try some of the other flavors. Well, this is a new one for me. Travel via train! 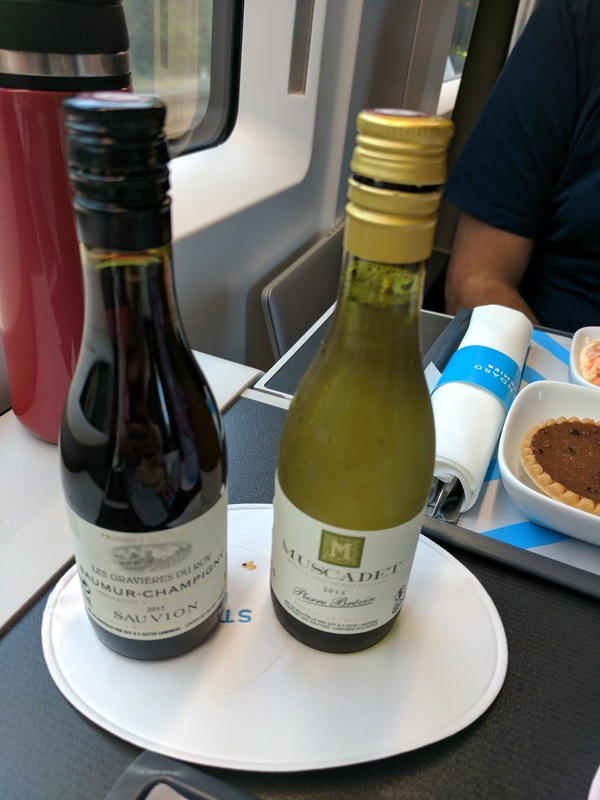 On my recent trip to Paris and London, I took the train between the two cities. I made a few errors in not realizing just how much time I needed in advance at the station in Paris (oops, it isn't like taking the subway ... you need to go through French and UK border control and through security in Paris ...), but wow, compared to air travel, it was amazing. I had a Standard Premier seat, a step up from Standard, but down from Business Premier. The experience included a full meal, and, given my 5:13pm departure, this was a nice touch, but of course I brought my own food on board in case it did not satisfy. My tray had a little chocolate and a dessert, along with the entree. 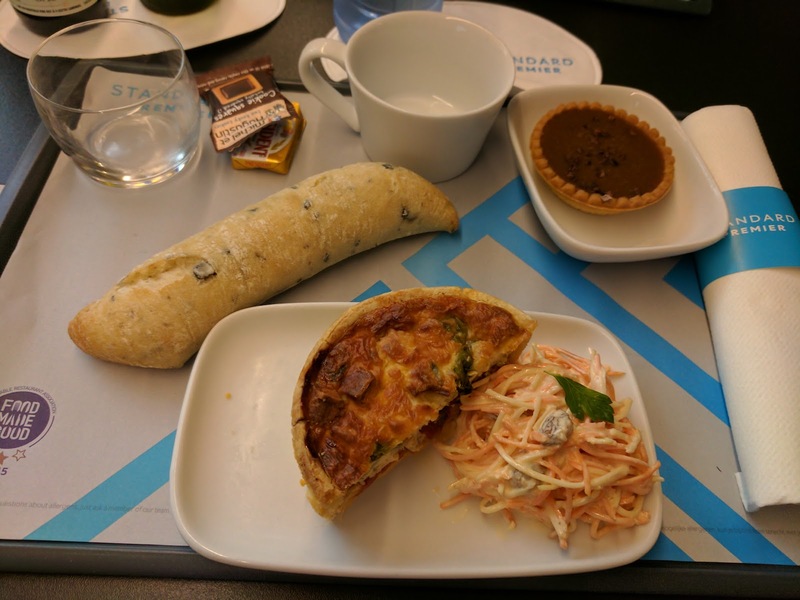 The entree was a veggie quiche with a side of carrot and raisin mayo slaw. A basket was offered with assorted breads and rolls. The tray also had President brand butter, salt and pepper, cutlery, and toothpicks. I selected a long olive bread. It was soft in a strange way. Ojan tried some kind of roll, and declared it stale and not good. Basically, airline quality bread. I tried the quiche, even though I hate quiche. It had some flavorful veggies inside, but, well, it was eggy quiche. The pastry crust was fine, but not particularly good. After a few days of amazing pastry in France, I didn't have much positive to say about this lower quality pastry. In fact, in my bag, I had a confit tomato, mozzarella, and puff pastry tart that I much preferred. The carrot and raisin slaw reminded me of British Airways offerings, in that it was just soaked in mayo. I ate it, and it was "fine", but, I didn't particularly want it. Dessert was a little caramel tart with a few cocoa nibs sprinkled on top. It was literally just caramel, thick caramel, but, caramel. Sweet, gooey, but not quite a full dessert in my mind. I liked the crunch from the cocoa nibs. The tart shell was a generic pre-made shell, not very good. My choice of red or white wine was also available, both French. I selected one, Ojan the other. The white was Muscadet, fairly harsh, not great. Same with the red. We were also provided water bottles. After the meal service, staff came through with tea and coffee, plus sweetener and milk. I opted for a decaf, which arrived lukewarm and was clearly instant. At least they tried. The service was friendly and efficient, and they even came to wipe up our table when they cleared the trays. Far superior to most air travel. So, overall, not great, but not awful, and it was nice that they had the meal option. Momofuku Milk Bar. I've written about it before, in detail, including all the history of my discovering it long before the masses, meeting the chef at her book signings in San Francisco, etc. If you are unfamiliar with the glory that is Momofuku Milk Bar, please start with that post, and then return here. While I adore the corn cookies, cereal milk soft serve, and zomg, crack pie from Momofuku Milk Bar, it had been several years since I had the opportunity to have any of their treats again. It was time to fix this. Momofuku Milk Bar has expanded significantly at this point, with several locations in New York, one in DC, one in Toronto, and now, one in Las Vegas too (getting closer!). But I hadn't been to any of those cities in years, until this past fall, when I finally returned to New York. You can bet that I went to Momofuku Milk Bar every night I was there, and re-fell in love with the soft serve and cookies. Stay tuned for those reviews! A couple months after my New York visit, we had an event to celebrate at my office, and I of course nominated myself to get the treats. After consulting with the guest of honor, I knew that I needed to find a good cake. It was Friday afternoon, and the celebration was planned for Wed, but Monday was a national holiday. I had a weekend, a holiday, and one work day only to pull this together. I called several bakeries around San Francisco, but most told me that they couldn't do an order with only one business day notice. Barely anywhere delivered. A sane person probably would have just ordered a Safeway cake and moved on. Or perhaps found a local place that wasn't too far away, and gone themselves to pick it up (which, I'm glad I didn't do, as it was pouring rain the day of the party!). But I'm not really a sane person when it comes to desserts. I decided to order a cake from Momofuku Milk Bar, from New York, via overnight mail. Because I knew they offered that service, and, I still had yet to try one of their cakes. 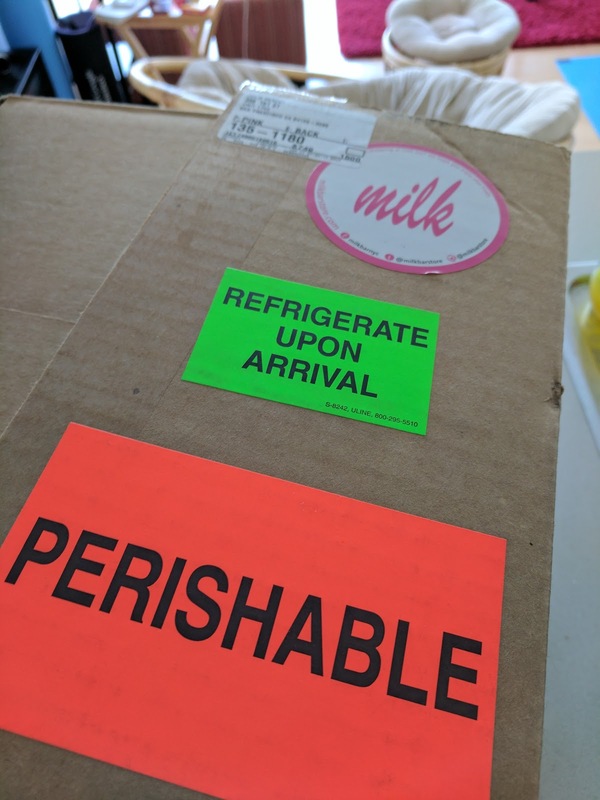 Ordering cake (or other products) from Momofuku Milk Bar is extremely easy online. You can order from their website, or through Gold Belly. Delivery across the country is $45, which did give me pause, but, I don't think it would have been much cheaper to hire a TaskRabbit or other courier inside San Francisco to fetch and deliver a local option. This was totally a reasonable move ... really. All orders are shipped via overnight mail. I scheduled my delivery for Tuesday, to ensure it would be there for the Wednesday party. Monday evening I got a shipping notice, and, Tuesday morning, it arrived. I may or may not have rushed home from the office midday to check it out. 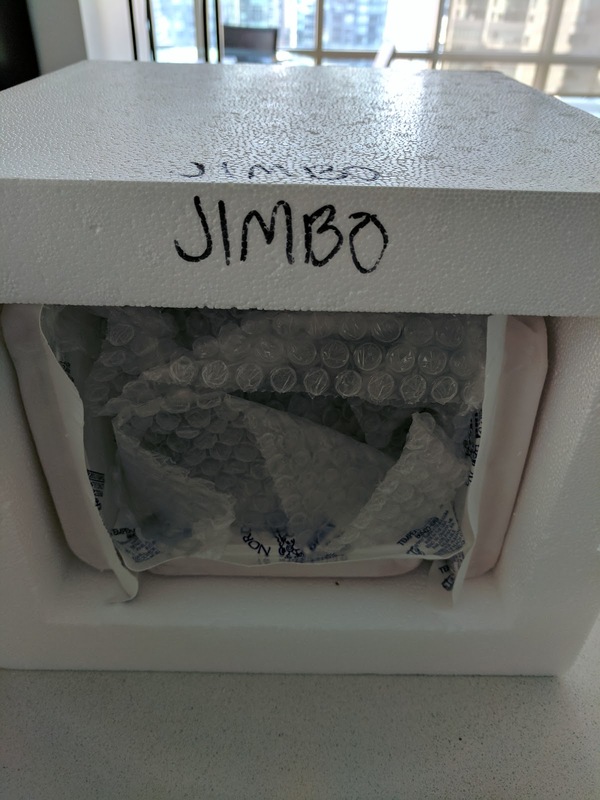 My box was well marked with bright labels indicating its perishability, which is good, as my front desk immediately put it in the fridge for me. There was also a cute Milk sticker, which meant something to me, and probably few others. 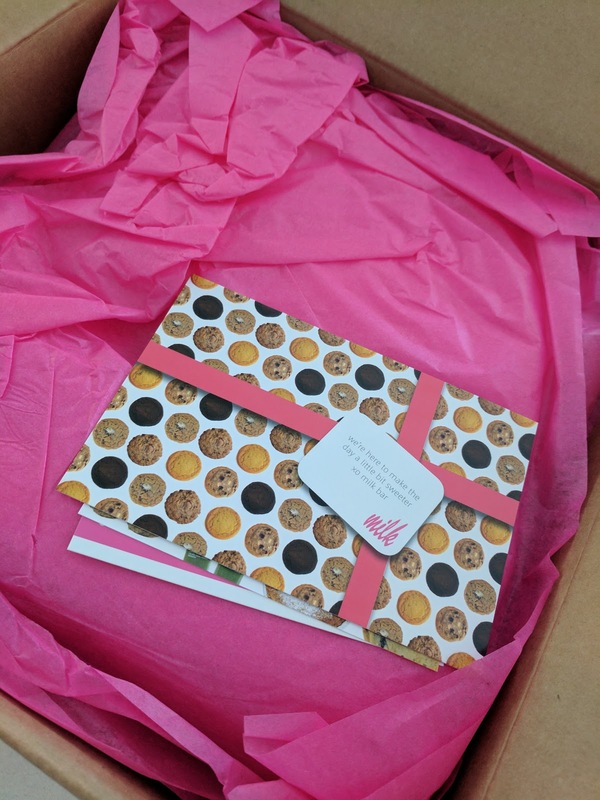 I was surprised to open the box and find a sea of pink. Pink tissue paper surrounded the box inside the box, and several cards were laid on top. 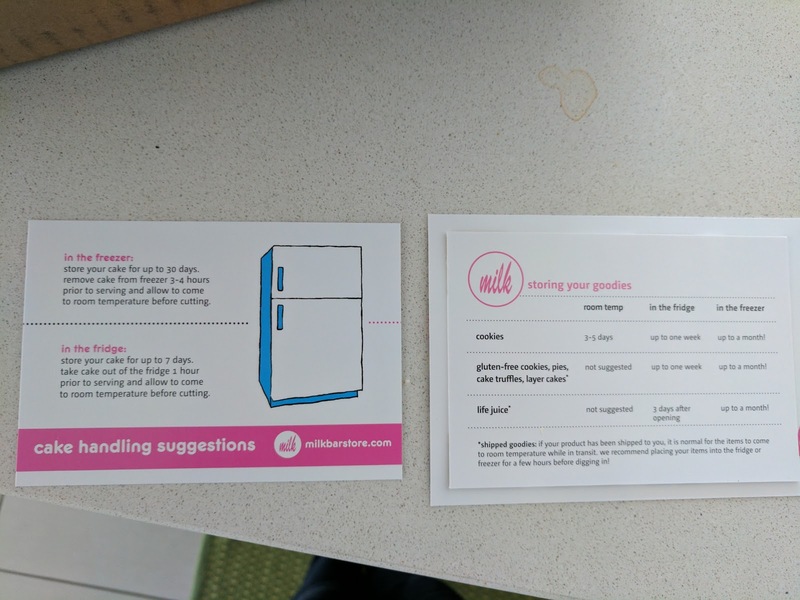 The postcards included info on how to store my cake and proper handling instructions. I could keep it in the fridge for up to 7 days (taking it out an hour before serving), or the freezer for 30 days (taking it out 3-4 hours before). Under all the pretty pink tissue was the real packaging. 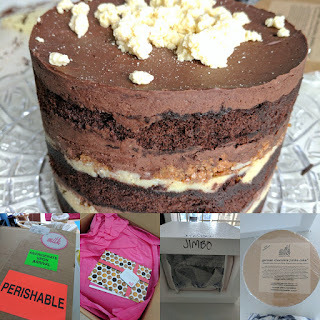 Smaller items came in a freezer bag, and the big cake was in a large styrofoam box. 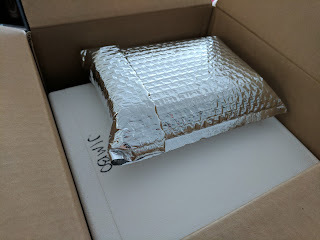 The cake came inside a styrofoam box, surrounded by bubble wrap, and three large ice packs. 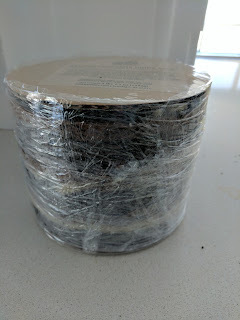 The cake was then wrapped up tightly on all sides, with cardboard disks on top and bottom. 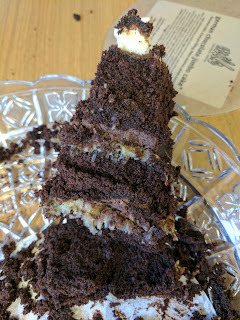 So, Momofuku Milk Bar cake. I had 8 choices for cake, all of which were fairly unique. I would have gladly consumed any of them. The cakes all follow a standard formula, starting with layers of cake, each coated with a soak to keep the cake super moist. They then have multiple types of filling, like jam, cheesecake, fruit compotes, or even crack pie. Frosting on top, but never on the sides. And some kind of "crumb" on top. To make any of these cakes, you essentially need to make at least 5 different recipes: cake, cake soak, filling, frosting, and crumbs. Just like the cookies, these are complex creations. I ruled out the chocolate chip cake because it had passion fruit curd, which is a flavor I am generally not a fan of. Same with the strawberry lemon cake, due to the lemon cheesecake filling, even though it had milk crumbs, a strawberry jam layer, and pickled strawberry frosting, which sounded very fascinating. I ruled out the apple pie cake because I don't generally like apple compote, although it was hard to look past the brown butter cake (treated with apple cider soak), brown butter cheesecake, pie dough frosting, and pie crumbs. Passion fruit, lemon, and apples, excluded. I still had 5 options. Narrowing in and choosing one from the final 3 options was hard. I've had my eye on the Momofuku Milk Bar birthday cake ... forever. Yes, it is just a birthday cake, layers of rainbow cake (treated with a vanilla milk soak) with vanilla frosting and rainbow cake crumbs, but I know how good those rainbow cake crumbs are. Alas, the occasion wasn't a birthday, so, I decided against it. Finally, I ruled out the dulce de leche cake, worried that perhaps it would be too sweet for my group, with sweetened milk, dulce de leche caramel, and dulce de leche frosting. Not everyone has the sweet tooth I do. So I went with the final option, the German Chocolate Jimbo Cake. German Chocolate Jimbo Cake. 6 inch. "A spin on the classic german chocolate cake! Chocolate cake layered with ooey-gooey crack pie® filling, flaky coconut and crunchy pecans! 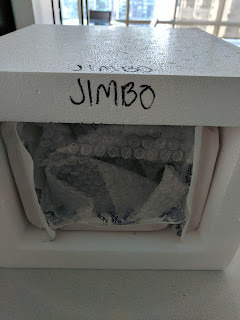 (milk bar first made this cake for jim nelson eic of gq magazine, hence the “jimbo”)". 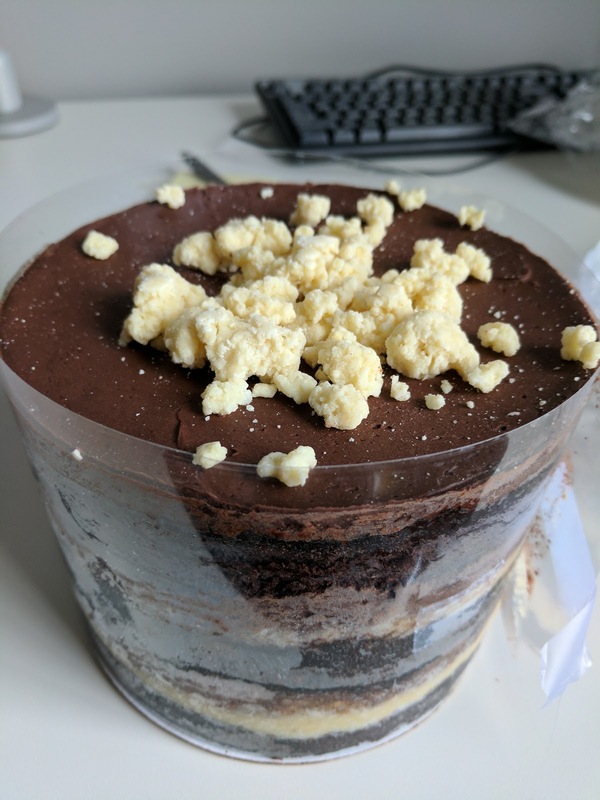 The most impressive thing about this cake, besides it surviving the journey perfectly, was the layers. 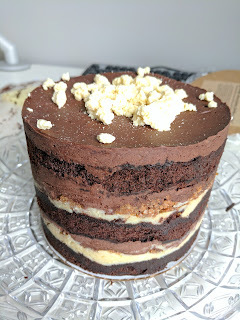 I know all Momofuku cakes feature layers, but, nothing prepared me for what it actually was. So, 3 layers of chocolate cake, 3 layers of chocolate fudge frosting, 2 layers of crack-coconut filling, and one layer of crunchy pecan filling, plus the coconut crumbs on top. And don't forget that the cake is soaked with "chocolate malt cake soak". (Note: the chocolate frosting might actually have been chocolate malt frosting, I'm not sure which was used). It was a stunning cake, in a non-traditional way. The lack of frosting covering the sides allows you to see the layers (yay!) but it also means that the imperfections are visible. It isn't a "clean" look. It is like one of those babies that is cute, but not in the generic way ... in a slightly ugly cute sort of way. You know what I mean. Cutting the cake was difficult. I knew the first slice would be hard, but I expected it to get easier after that. It didn't. Kudos to anyone who can serve this without mangling it. Not that anyone complained about being served a pile of cake layer rubble, but, it certainly wasn't pretty. But, the real question ... how did it taste? Honestly, it was a mixed bag for me. The chocolate cake itself was fairly dry. 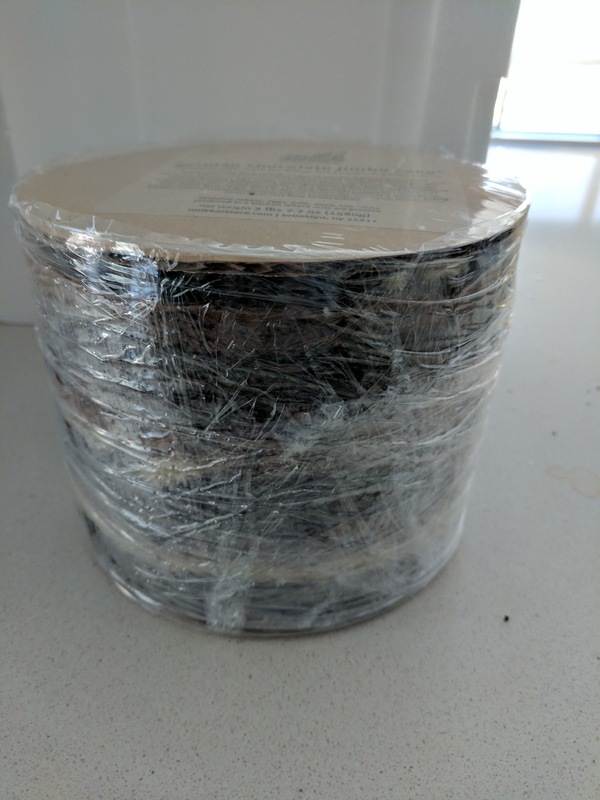 The cake was overnight mailed on Monday, I received it Tuesday and immediately put it in the fridge, and we ate it Wed at 1pm. Maybe it was more moist originally? It was dense, chocolately cake, but, drier, and far more crumbly, than I expected. The cake was my least favorite element, but, I'm never a huge fan of cake itself anyway. The chocolate fudge (or malt?) frosting was creamy and rich. It was tasty enough, particularly when combined with the other fillings, but really, just standard good frosting. The other fillings are where things start looking up. The pecan crunch layer in the middle was one of my favorite elements, as I love pecans, and the additional crunch from the nut bits was great. But the best filling was the crack-coconut filling. It was a gooey coconut filling, with plenty of shredded coconut, that combined into very good bites with the pecan crunch and chocolate fudge. I'll admit to feeling a bit let down that it didn't really resemble crack pie in any way other than that it was sweet and gooey, but, it was still quite tasty, so once I reset my expectations, I didn't mind. My absolute favorite component however was the crumbs on top, I think coconut cake crumbs. I loved the texture, the buttery nature, and the strong coconut flavor. I've had many of the other flavors crumbs before, and I continue to think they are really the best part of Momofuku Milk Bar. I honestly wish I could just buy crumbs, to use as an ice cream topping, or, uh, snack mix.